Big B Agro is ready to be your propane specialist. We offer Central Illinois homeowners quality products at a competitive price with the service you deserve. Our customers benefit from reliable delivery and payment programs that make it easy to do business with us. Heading out on a camping trip? Firing up the grill? Operating your forklift? Whatever your need, Big B offers refilling options to keep you going. Use our fast drive-up service during business hours or drop off your cylinders at your convenience. Save money with our value pricing and your own cylinders! Keep your most important equipment operating safely and efficiently with farm fuel services from your local farm fuel and lubricant specialists. All of our diesel fuels are treated with the “Power Max” additive, truly making them the best Premium Diesel fuels marketed in the area. At Big B Agro, we pride ourselves on being one of the best providers of propane and farm fuels in Central Illinois. We specialize in residential and agricultural propane service, quality and reliable farm fuels, equipment sales and installation, prompt and dependable service, and more to our customers across our service area. 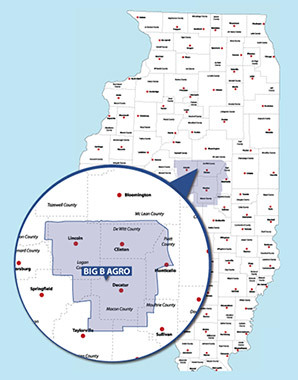 Established in 1974, Big B Agro has been servicing Central Illinois homeowners and farmers for over 43 years. As a family owned and operated business, we have always kept customer service and community involvement as our top priority. When you choose Big B Agro to meet your energy needs, you can experience the service scale of a large provider with the attention to detail of your neighborhood business. Contact us today to learn more about your propane and farm fuel options in Macon, Logan, and DeWitt counties.